Andrei Bystritsky, chairman of the board at the Foundation for the Development and Support of the Valdai Discussion Club, speaks at a meeting as part of the 13th annual meeting of the Valdai Discussion Club, Sochi, Oct. 25, 2016. 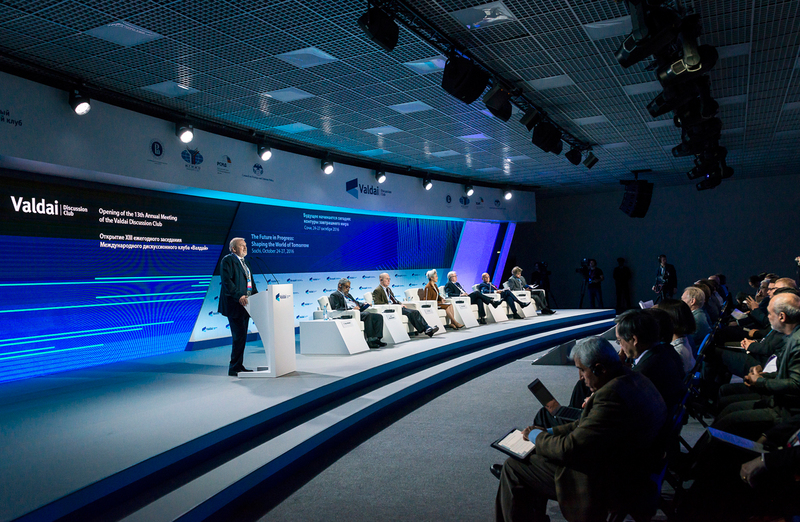 At this year’s meeting of the Valdai International Discussion Club, representatives of government and academia from around the world are focusing on the changing world order and what countries will play the biggest role in the future. Politicians and experts from 35 countries, including Russia, the United States, China, India and Australia are meeting in Sochi from Oct. 24-27 for the 13th annual gathering of the Valdai Discussion Club. The group meets every year at different locations in Russia to share views on the problems facing the global community today. This year, participants have stressed the irreversibility of the changes currently taking place in world politics, predicting tectonic shifts in the global political order in the very near future. During the first session of the meeting, John Mearsheimer, a professor of political science at the University of Chicago, said that the current world order is going through a period of transformation, moving from a unipolar structure to a situation in which key issues depend not only on the U.S. but also on the political course of the two rising superpowers — Russia and China. Such a situation will soon require leaders from all three countries to make key decisions in relation to the strategic courses of the others that will shape the future order of the global political landscape. Mearsheimer says that a conflict between the U.S. and China is inevitable if Beijing’s economic and political influence in Southeast Asia continues to grow. He adds that the foreseeable deterioration in U.S.-China relations will require Moscow to decide how to best align its interests. "Russia has three choices: Number one, they can ally themselves with the Chinese; Number two, they can ally themselves with the U.S, which basically means joining in the balancing coalition against China. Or the Russians can remain neutral and play U.S. and China against each other,” Mearsheimer said. A Chinese government representative at Valdai categorically disagreed with the American expert, underlining that China is not seeking responsibility for supporting the world order. Fu’s words, however, did not convince Sergei Karaganov, Dean of the Faculty of World Economy and World Politics at the Higher School of Economics in Moscow. "Russia and China are changing and deconstructing the order that the U.S. has tried to impose after the Cold War. Russia is doing it powerfully, China — softly, in the Chinese style," Karaganov said. Mearsheimer agreed with Karaganov that China is not completely pleased with the state of affairs in world politics. He thinks that the development of China's economic and military power will inevitably result in an intense competition between Washington and Beijing. 'The U.S. drove the Russians into the arms of the Chinese and there is no guarantee that the U.S. will be smart enough not to antagonize Russia further, pushing it to the Chinese," Mearsheimer said. The Valdai Club experts question the role the European Union will play in the determining the new world order, mostly relegating it to the status of a supporting player largely dependent on decisions made by Russian, American and Chinese politicians. In Mearsheimer's opinion, the EU's future will depend on how much Washington reorients its strategic interests toward the Pacific Region. Former Australian Prime Minister Kevin Rudd, who is currently the president of the Asia Society Policy Institute, agrees that Europe is losing its political significance in world processes, leaving the initiative to the U.S., Russia and China. The issue of the EU's "conceptual crisis" will be discussed at a session on October 26. The Valdai Club sessions will continue until Oct. 27 and will conclude with an address from Russian President Vladimir Putin.